Background and Aims: The association of overweight and cardiovascular disease is not clear. Our objective was to examine the prevalence of Coronary Artery Calcium Score (CACs) in overweight subjects with and without abdominal obesity according to waist-to-hip ratio (WHR).Methods: We enrolled 276 patients aged between 40 and 70 years, with a BMI of 25-29.9 kg/m2 and at least 1 cardiovascular risk factor. Exclusion criteria were diabetes, cardiovascular or renal disease. Patients were stratified in high or normal WHR group according to WHR (>= 0.85 for women and >= 0.90 for men). CACs, carotid intima media thickness (IMT) and plaque presence were equally assessed.Results: CACs prevalence was higher in the high WHR group than normal (59.6% vs 38.5%, p <0.001). CACs was higher in the high WHR group compared to normal (9.05 [0.0-83.48] vs 0.0 [0.0-64.7] AU, p < 0.01). 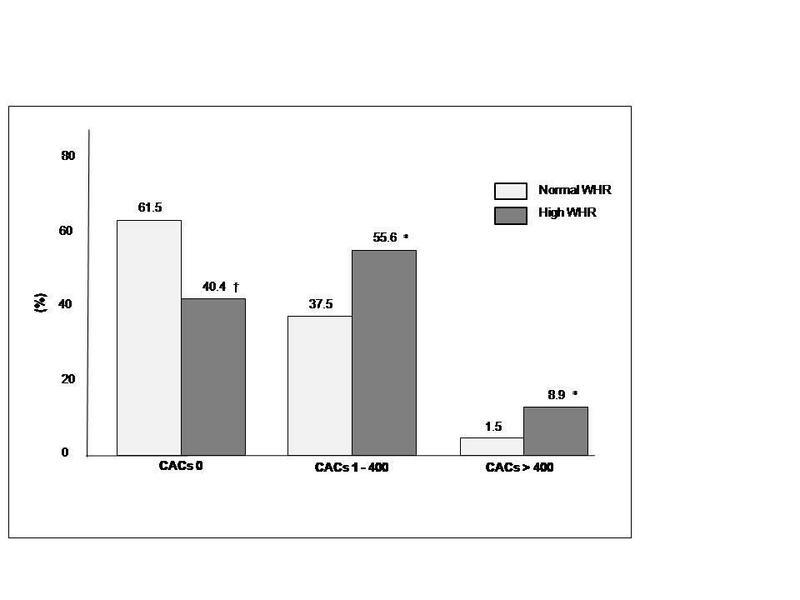 Thirteen patients with high WHR (8.9%) had a CAC > 400 compared to two subjects with normal WHR (1.5%, p <0.01). Carotid plaque prevalence was higher in subjects with high WHR than normals (63.7% vs 50.8%, p <0.05). Patients with high WHR had higher mean IMT than normals (0.64 [0.56-0.72] vs 0.59 [0.55-0.67] AU, p <0.001). Logistic regression showed that high WHR was associated with CAC and carotid plaques (p <0.01 and <0.05, respectively). After multiple linear regression, IMT was associated with WHR levels (p <0.05).Conclusions: WHR is associated with higher coronary and peripheral atherosclerotic burden in overweight patients.